The blood donation activity is held in the office of North Jakarta Fire Handling and Rescue (Gulkarmat) Sub-dept., Jalan Semper Barat, Cilincing today, Thursday (2/15).
" Those who participate in the blood donor are firefighters, freelancers and Dharma Wanita members"
North Jakarta Fire Handling and Rescue Sub-dept. Head, Satriadi Gunawan said, the blood donor joined by 100 participants is to welcome the Fire Dept. 's 99th anniversary. 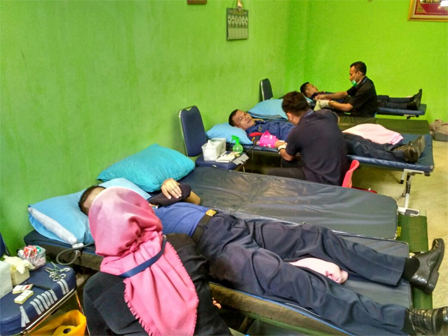 "Those who participate in the blood donor are firefighters, freelancers and Dharma Wanita members," he stated, Thursday (2/15). He explained it is Gulkarmat's concern for humanity. In addition to North Jakarta, similar activities will also be implemented in five other areas in Jakarta. "It is very important. We want our existen ce to benefit others," he stressed.